Claim up to £600 cash-back! On your next purchase of Mitas or Cultor agricultural tyres. 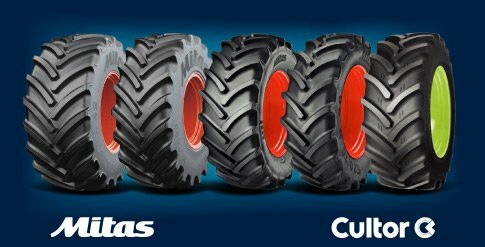 The Mitas brand offers a comprehensive range of radial and cross-ply tyres for tractors and trailers and a wide range of industrial, multipurpose tyres (MPT) and earth-mover tyres (OTR). Offer available from 1st April 2019 to 31st May 2019. Trelleborg Wheel Systems UK Ltd., Unit 1, 4a Redwing Court, Long Acre, Castle Donington, Derby, DE74 2UH. Download your claim form below. 1. The Mitas special offer action is open to all consumers who are UK residents aged 18 and over, except Mitas Tyres Ltd. employees, its agencies or anyone else connected with the creation and administration of this Promotion. 2. By participating in the Promotion, claimants agree to be bound by these terms and conditions and by any other requirements set out in the promotional material. 3. There is a purchase requirement. Claimants must purchase at least two qualifying agricultural tyres in a single transaction between 1st April and 31st May 2019. 4. Promotion only available at participating tyre dealers. 5. Closing date for receipt of claims is 30th June 2019. 6. Claims must be made on an official claim form. Claims must be completed in ink and must be accompanied by a valid original invoice highlighting the tyres purchased. It is recommended that you keep a photocopy for your records as claim forms and invoices become the absolute property of the Promoter and will not be returned. Please post back to: Trelleborg Wheel Systems UK Ltd., Unit 1, 4a Redwing Court, Long Acre, Castle Donington, Derby, DE74 2UH. 7. The Promotion will reward a cash back gift card to the value shown above. Gift cards will be sent within 30 days from receipt of claim. 8. Lost, incomplete, invalid, illegible or late claims will not be accepted and proof of posting shall not constitute proof of receipt. The Promoter reserves the right to discard illegible claim forms. The Promoter reserves the right to dispute a claim if it believes the claim is not legitimate. The Promoter's decision is final. 9. Please refer to the literature accompanying the gift card for full terms and conditions of its use. 10. The gift cards are non-transferable and no cash alternative will be offered. 11. The gift cards are subject to availability. The Promoter reserves the right to substitute with an alternative prize of equal value in the event that circumstances beyond its control make this unavoidable. 12. Trelleborg Wheel Systems UK Ltd. will not be liable for any tax liability in whole or part incurred by participators or individuals as a result of this Promotion. 13. Promoter: Trelleborg Wheel Systems UK Ltd.